Have you ever taken a look at your house exterior and felt there’s something off about it? 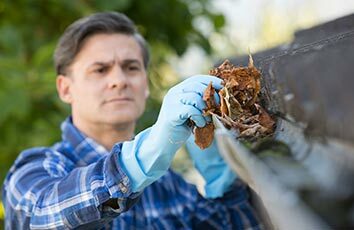 If you pay attention to details, you will soon notice that your gutters, as clean as they may be on the inside, look rather old and dirty on the outside. Where is that pearly shine they once had when you first moved in? The problem with gutters is that they are some of the most beaten down structural elements of your house. 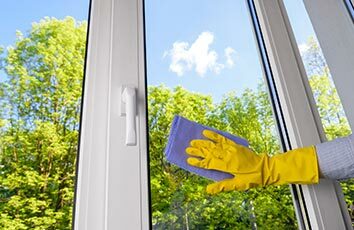 They get filled with dirt all year long, and they also accumulate grime and dirt due to permanent exposure to the elements. 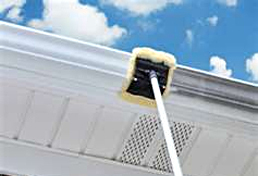 Usually, gutters get some bad-looking black stripes known as Zebra Stripes (or Tiger Stripes) – dirt marks that are incredibly hard to clean with traditional methods. They form due to electrostatic bonding: moisture overflow pours down your gutter and pulls chemicals along with it. To add more troubles, cleaning the gutters on your own can be a risky task, especially if you own a tall house or you don’t do well with heights and ladders. What Are the Advantages of Whitened Gutters? Many homeowners overlook the importance of having white shiny gutters – they invest a lot in the house exterior and landscape, but dirt-striped gutters are indeed an eyesore, especially if you are thinking about real estate value. Whitened gutters significantly increase your property’s curb appeal, making it more attractive to prospect buyers. What Can Mr. Wright’s Do For Your Gutters? First, we inspect your gutters and assess the situation. This preliminary evaluation helps us tailor an intervention strategy that will be both safe and effective. 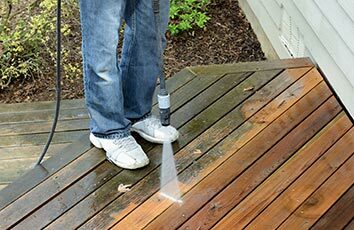 We will then use powerful, proprietary chemicals to remove the oxidation stains, mold, mildew, dirt and grime from your gutters and give them back their shine. Our soft power washing equipment will offer a thorough and non-damaging rinsing, leaving your gutters looking brand new, without any trace of Zebra Stripes. Our products and technologies are safe to use, as they don’t harm surfaces and don’t chip away paint or other finishing. Moreover, the results are long-lasting, and you won’t have to call us again in a few weeks to redo the job. Have your gutters cleaned and whitened right now for affordable prices. All you have to do is write to us or give us a phone call asking for a free estimate! Our team will make a thorough assessment and offer you the best pricing and working plans. And everything is risk-free, as our 100% Satisfaction Guarantee ensures you that we will come back to fix things or give you a refund/discount in case we missed something!